We just finished a great weekend at the Teva Games in Vail, Colorado. 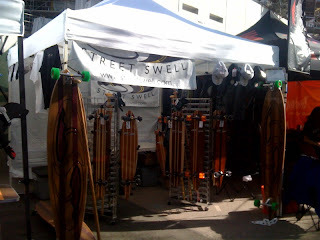 We had hundreds of people stop by to check out the boards and talk about longboarding. The highlight of the event was watching three New Zealanders’ paddling along on one of our Daisy Cutters and a Kahuna Big Stick. It was fun to expose people to the sport of Longboarding. If I had a nickel for every one that said “I used to skateboard when I was a kid” I would have a bunch of nickels. One of our goals is to get people back into a sport they all loved as a kid as well attracting new people to the sport. Sure selling some Street Swell boards would be nice too, but it doesn’t really matter what you are riding, as long as you are riding. You will not get a nickel from me becuase I NEVER as a kid rode a skateboard but now that I have one of your awesome longboards I am hooked! Better late than never they say.